In one of the tents at the ongoing India Art Fair in New Delhi, Shanthamani Muddaiah's sculptural installation made of burnt bamboo and cane is an arresting vision. Titled 'Carbon Wave', it seems to forecast a possible ecological disaster with its snarly wave-like formation in jet-black; it teases onlookers with questions on nature and sustainability. You cannot touch this oncoming wave of darkness and destruction. But a few metres away, in the same art projects tent, showcasing immersive works by contemporary artists, there is a smaller 45cmx60cm replica of 'Carbon Wave'. 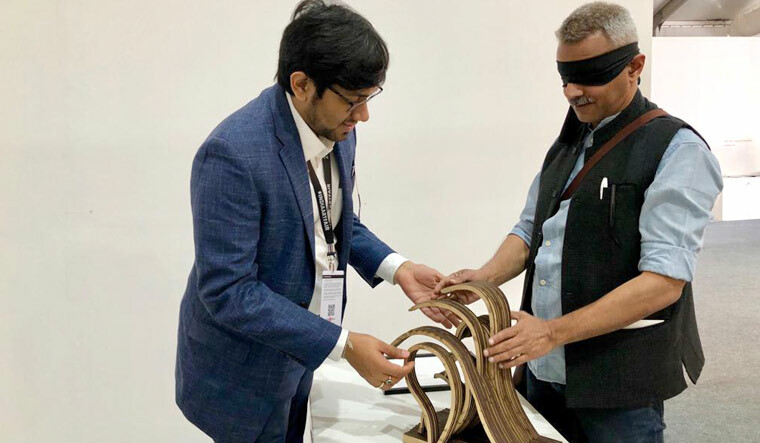 "It is made of cane and bamboo, like the original, and we have burnt the bamboo as well like the artist to recreate the smell of burnt wood," says Siddhant Shah, who is the first architect in India to enable the arts industry to engage with visually impaired and special needs visitors. "The most exciting part of this is how we encourage the viewers to come and touch these artworks which is normally forbidden," says an effervescent Shah pointing to the "Please Touch"-headlined description in Braille next to the replica of 'Carbon Wave'. The 11th edition of India Art Fair, among other exciting new initiatives, has, for the first time, sought to make the much-awaited annual gathering of the Indian art world more accessible to persons with disabilities. There are tactile Braille replicas, images and maps of the artworks and the venue, guidebooks, ramps, wheelchair accessible toilets. sign language interpreters for artist talks, discussions and volunteers for visitors with special needs.  And all of these inclusive measures are brought together by Shah, who is the co-founder of Access for All—a design and advocacy organisation for the promotion of inclusive consumption of art and culture—with his mother who is partially sighted and is also an arts educator. The company offers disability access audits, Braille-tactile reproductions, museum Braille books and signage, heritage interpretation and sensitisation programmes for museums, monuments, art galleries and cultural foundations. Shah has worked with Delhi Art Gallery Modern, published India and Pakistan’s first museum Braille publication, designed Braille tactile miniature paintings for the City Palace Museum of Jaipur, apart from working with Kala Ghoda and Serendipity Arts Festival. 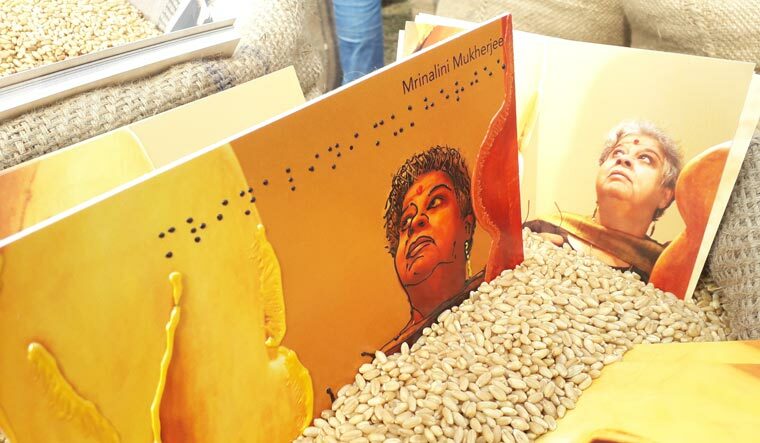 On the first day of the Art Fair, Shah held sensitisation programmes with VIP guests who were blindfolded and were encouraged to experience tactile works in a simulated setting, apart from holding similar sessions with schoolkids with special needs. Some of these artworks included Neha Verma's 'The Layer', which is pieced together with intricately cut papers designed to look like a carpet whose borders were layered with pieces of actual carpets, and Manisha Baswani's 'Postcards from Home' where Shah replicated six postcards by 3D layering and printing—based on stories by Indian and Pakistani artists—in A5 size. These postcards were kept in sacks of wheat grain. The India Art Fair will end on February 3.